Batch processes are widely used in a range of industries, from food and drinks to pharmaceuticals. And of course, in order to monitor and control the batch processes it is required to analyse batch data from a series of batches in order to establish the normal operating region, ie to describe the trajectory from raw materials to end products. 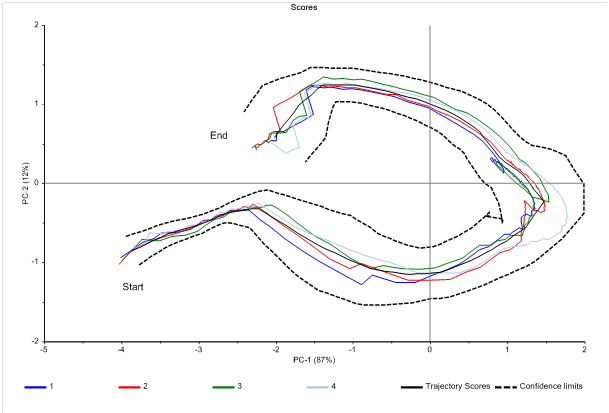 An established trajectory with corresponding confidence limits can be used for real time monitoring and control analogously to standard statistical process control (SPC). A fundamental challenge experienced in batch processes with several phases or varying duration is the mapping from process progression time to operational time. The process progression or relative time correspond to chemical or physical transition depending on the type of process. The operational time is the clock time, or the time experienced by operators. For two subsequent batches the operational time might be 40 and 44 minutes. The transition from raw materials will be identical or near identical so relative time will be 100 say, for both batches. If the two batches are monitored by some measurement system every half minute for instance, data are generated and can later be compared or used to model the trajectory. However, the analyst has now the problem that batch 1 has 80 measurement points while batch 2 has 88 measurements. CAMO has introduced a batch modelling approach which can handle batches where the operational time varies. The method maps operational time to relative time and displays the trajectories with limits. A trajectory within the limits corresponds to a batch adhering to the transition described by the model or the normal operating region analogously to within limits processing in SPC (Statistical Process Control). Note that operational time can vary and the relative times for the batches are still within the confidence limits, ie in control. One example area where the CAMO’s approach to batch modelling has proven to be very useful is fermentation and other bioprocesses. By default the operational time in bioprocesses does vary, and often there are different phases. Both in terms of mapping of the operational time to relative time and also phase transitions the CAMO batch modelling tool has proven effective. The CAMO batch model also keeps working in processes where there is reversing of the transition. The CAMO batch mode/ling approach is a multivariate approach. This means that many parameters are monitored and modelled at the same time. Accordingly, the batch trajectories can be developed from advanced sensors such as spectrometers of different types to fully benefit from the resolution and sensitivity of these. The batch trajectories can also be developed using several single value parameters, such as O2, pH, temperature etc. The multivariate approach means that changes in the relation between parameters (covariance) are detected, which is essential in early fault detection. Simultaneous small changes in, eg, temperature and pH can be an early indicator of problems in the batch which might only be detected much later if just one of the parameters is monitored. In order to use the batch modelling tool relevant measurements for a couple of batches are required. The data are decomposed and the confidence limits in the multivariate space are calculated. When new batches are run measurements taken in operational time can be projected on the model describing the batch trajectories, and the measurement points are translated to relative time. The operator can then follow the trajectory within the batch tunnel as the batch is progressing. All in all the new batch modelling approach provides companies within all industries an easy to use and robust tool for monitoring batch processes. The underlying calculations are a little bit more complicated, but the output is as easy to use as standard SPC (Statistical Process Control). Dr Geir Rune Flaaten is CTO, CAMO Software AS. Figure 1 The batch trajectory from CAMO Software. A model is developed to calculate the confidence limits shown by the dotted lines in the figure. This batch tunnel correspond to the underlying transition in the process, and new batches can be monitored and controlled analogously to traditional SPC (Statistical Process Control).